This particular matter has been discussed several times before by both professional historians and amateurs, but there's always room for another try. What If Sweden had won the battle of Poltava on June 28th, 1709? Did the Swedes stand any chance of winning, and how were they planning to continue the war, had they won the battle? One fact that we know is that due to the acute shortage of supplies, the Swedish high command had forsaken the idea of resuming the advance towards Moscow already before the battle. The only logical alternative was to withdraw the army from Ukraine back to Poland, and this was realized by field-marshal Carl Gustaf Rehnsköld and the King Carl XII himself, that much is clear. But, even still, to ensure the safe exit, the Tsar and his army had to be taken out first, the Swedes had to fight to get away. The plans for the battle are well-known. The Swedish infantry was to break through the Russian fortifications between the Forests of Iakovtsy and Budishchi, after which the cavalry was to proceed by cutting the Russian northward retreat route on the bank of Vorskla. The infantry would attack directly against the main Russian force, with the cavalry supporting the attack on the northern flank; thus, caught between the hammer and the anvil, with their backs against the river, the Russians would be totally destroyed and the Swedes would have a free journey back home. The chances of Swedish victory weren't good. The Swedes were seriously exhausted by the harsh winter and the campaigning of the previous year, whereas the Russians were rested and ready, and far better trained, led and armed than in Narva. Above all, the Russian artillery had an overwhelming superiority, with 102 guns on the field; the heavy pieces included twelve 8-pound and two 12-pound cannons, 20-pound and 40-pound howitzers, and one 20-pound and two 40-pound mortars, all with virtually unlimited ammunition. In contrast, Swedes had exactly four 3-pound cannons on the field, and the munitions were, quite simply, running out; the infantry and the artillery had enough firepower for one strike, after which all bets were off. Aside the materiél shortage, the Swedish ordre de bataille went about as wrong as possible from the very beginning. Three regiments under general major Roos, a third of the Swedish infantry, were locked in a bloody and unnecessary assault against the third Russian fortress, eventually went astray, lost the contact with the main army and had to surrender. The initially succesful concentration of the Swedish cavalry ended with the squadrons caught in an absolute organizational chaos on the worst possible terrain between the forest of Budishchi and the nearby swamp. And finally, as general Adam Ludvig Lewenhaupt led the remaining 4'000 men to the final bayonet charge against 22'000 Russians, the left and the right flank of the Swedish infantry drifted apart, and the enemy was free to do a variation of the classic Cannae, encircling and eventually routing the Swedish army - but even at the last moment, it at least seemed that the Swedish assault just might make it, break the Russian ranks, force the enemy to retreat and win the day for the Carolins. Now, let's do some vigorous handwaving and throw in the "if"-factors. Roos behaves less rigidly, and after the breakthrough, all of the infantry proceeds in an orderly formation directly against the Russian main army. The Swedish cavalry gets through succesfully, keeps its act together and backs up the final attack. The assault with cold weapons is well-ordered and succesful, and the Russians are smashed against Vorskla. Rehnsköld will no doubt give the Russians the same treatment he did in Fraustadt, which means that no prisoners will be taken. The entire Russian army of 44'000 men is destroyed/routed, those who try to surrender executed, Poltava stormed, and Tsar Peter forced to retreat from the scene (his hat was shot off his head during the battle in our timeline, so killing him might also be an option, but I'll save that variant for someone else). 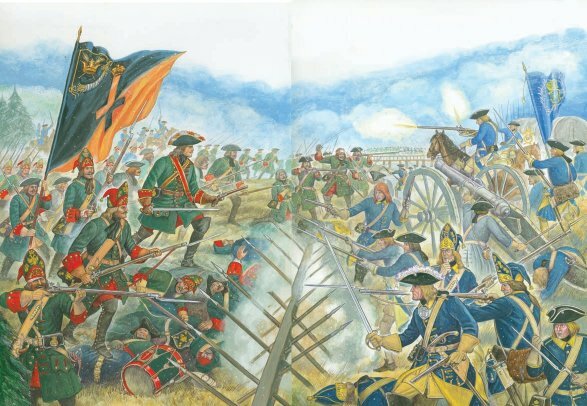 The summer of 1709 is beautiful, the Swedish armies remain unbeaten on the field, and the road is clear for them to withdraw in peace and cross the Dnepr safely at Perevolochna. The difficult march from Poltava back to Poland with low rations would undoubtedly take a heavy toll and bear a very close resemblance to the Napoleonic catastrophe hundred-and-two years later. What's more, the Swedes would be marching towards another fight; taking the direct route through the central parts of the Ukraine would mean a collision with the large Russian garrison stationed in Kiev. This could be avoided by taking the more southern route through Podolia, but even in that case, there'd be one more obstacle between the main army and general Krassow's troops in Jaroslowicze: general Goltz's Russian force, which was occupying Lwów with the support of the Lithuanian troops of hetman Sienawski. But well, let's be broad-minded and assume that the news of the victory will allow Krassow and his soldiers an opportunity of action. As soon as general Ridderhielm's regiments from Wismar (en route to Wolyn since March 1709, inevitably under another commander later on, since Ridderhielm would die in August 1709) arrive, Krassow takes Lwów and clears the stage for the triumphant return of Carl XII on, say, November 1709. As an estimate, ca. 10'000 men would have probably survived the march from Poltava to Poland. Roughly 50% casualties on the road back, with a total of 75% on the whole Russian campaign; not a good ratio, but still hell of a lot better than the total annihilation which took place in our history. The end result is that Carl XII has won yet another battle of epic proportions, but he still hasn't won the war. The Russian campaign of 1708-1709 has ended in a strategic defeat for Sweden, but the King can still claim victory; hardly anyone will notice the truth in the afterglow of Poltava. By the autumn of 1709, the Swedish King is once again in Poland and free to redeploy his forces wherever they're needed. The next subject to be examined is what kind of an impact the aftermath of Poltava would have on the international relations between the various European powers. One immediate political consequence of the Swedish victory at Poltava would undoubtedly be the entry of the Crimean Tatars and the Ottoman Empire in the war. Khan Devlet-Giray had expressed his enthusiasm to commence hostilities against the Tsar all through the summer of 1709, but the Porte had restrained him, preferring to wait for the outcome of the Ukrainian campaign first. In the history we remember, the struggle between grand vizier Corlulu Ali's doves, backed by Britain and Russia, and Devlet-Giray's hawks, backed by France and Sweden, ended with the victory of the latter party and the ascendancy of Baltaci Mehmet as the grand vizier in August 1710. In this alternate timeline, we can expect the talks in Bender to restart immediately after the battle, with the usual bribes and Stanislaw Poniatowski's infiltration of the court included, and the result would be an earlier Turkish attack against Russia; Poltava would provide a powerful argument for the war party, and the chance to exploit the situation and take revenge would simply be too good to pass. So, in this situation, the Tsar would be facing another threat from the south, at the time when his main army in Ukraine has just been destroyed. Considering that the Turks can throw in an army of ca. 150'000 men and were able to inflict a near-catastrophe on the Russians on Prut in 1711, the southern threat will most certainly require a good part of Peter's attention for the winter of 1709-1710. The difference to our timeline will be that this time around, the Ottomans will strike first, both on Prut and against Azov. Regretfully, not even the victory at Poltava could save Sweden's Ukrainian allies. The destruction of Baturin by field-marshal Aleksandr Danilovich Menshikov in November 1708 and the destruction of the Sech itself by general Petr Ivanovich Iakovlev in May 1709 had already deprived the Zaporozhian Cossacks of any prospects of succesful resistance, and the Swedish command had used hetman Ivan Mazepa's 1'500 poor, depressed cossacks mostly as a cannon fodder during the Ukrainian campaign. Under hetman Pilip Orlik, the Cossacks would still continue to play a modest part in coalition with the Tatars - after the Russian occupation of Ukraine, a new Sech had been established in the mouth of Dnepr, on the Crimean territory - and back up the Turkish invasion with cavalry raids in 1709-1710, but it'd be little more than a prolonged death-struggle with no real hope of succeeding. Likewise, the last peasant uprisings following the rebellion of Kondrati Afanasevich Bulavin in the Don territories would inevitably be extinguished also in this alternate timeline. Whereas the Turkish participation would be accelerated, it's fairly certain that with a major Russian defeat, Denmark-Norway would choose not to re-enter the war at this point. Thus, Öresund will remain open for Swedish commerce, there will be no Danish incursion in Skåne in November 1709, no Danish naval attacks against Swedish transports in the southern Baltic, and the Swedish forces raised by Magnus Stenbock in Skåne and Blekinge will be free for operations elsewhere. The Danes will certainly still continue the preparations for recommencing the hostilities and keep a watchful eye on the developments. Poland-Saxony is another matter. Stanislaw Leszczynski's position was already crumbling well before Poltava and the Confederation of Sandomierz was beginning to raise its head once again, even though the few Polish supporters that August II had weren't all that willing to accept the return of the Saxon Elector unconditionally. However, in this alternate timeline, Stanislaw wouldn't have any urgent need to retreat, and without the support of field-marshal Menshikov's troops - who'd be either decimated in Ukraine or concentrated against the Turks by now - it's unlikely that August would dare to intervene alone in the winter of 1709-1710. Also, the Poles of Sandomierz could hardly pose anything more than a bloody nuisance at this point, and as soon as Carl XII returns, his personal presence within the Polish borders should be more than enough to keep Stanislaw on the throne, maintain order within the Rzeczpospolita and forestall all attacks from Saxony. The less important events in the periphery known as the Western Europe would most likely continue very much as in the history we remember. The outcome of Malplaquet on September 11th, 1709 will be similar to our timeline, the War of Spanish Succession will continue its due course and the autumn of 1710 will eventually bring the Tories back to power in Britain. Odds are that both Louis XIV and the Western Allies will once again approach the invincible King of Sweden, but in my opinion, Carl XII would, once again, refuse to join with either side. The rather different setup of the Great Northern War will still have some effects on the international European relations. Without the Saxon re-entry to the war and Krassow's subsequent retreat to Pomerania, there won't be any substantial Swedish military presence within the German borders, and thus no direct threat to the peace of the Empire and no diversion of German forces away from the Rhine. Consequently, as the maritime powers won't have any reason to become antagonized against Sweden, the Convention of The Hague won't take place in March 1710. Even if the war against France would prompt the Allies to take some similar action to secure the neutrality of the Empire, it's possible that Carl XII might choose to accept such an arrangement. In our timeline, he refused mostly because the settelement would have effectively interned the Swedish army in Pomerania and compromised his freedom of action in an already intolerable predicament; this would hardly be the case in a situation where Russia still remains as Sweden's only active enemy. Likewise, it's a safe bet that the Baltic trade won't be as seriously disrupted as it was after our timeline's Poltava, and the Baltic naval stores will continue to be secured for the maritime powers. Despite the Naval Stores Act of 1705 and the continuing attempts of the Navy Board to develop Ireland and the North American colonies as suppliers of hemp, flax, tar and timber, Great Britain was still largely dependent on the resources from Estonia, Livonia and Finland at this time. This, of course, gives a certain diplomatic advantage with regards to Britain to anyone who controls the provinces, and the issue of who dominates the Baltic lands in 1710 will be dealt with more closely in the third part. Peter's Turkish distraction won't entirely deflect the Russians from pressing their goals on the Baltic. Field-marshal Boris Sheremetiev's army will certainly march against Kurland and lay siege on Riga in the autumn of 1709, and in the north, the Russians will also tighten the noose around Pernau (Pärnu) and Reval (Tallinn). Due to the commercial importance of Riga - see the previous part about the Livonian trade and the naval stores - and Sweden's plans of incorporating Kurland into the realm, the Swedes would definitely consider the Russian move on the Baltic as the most important threat to deal with. With the Danish and Saxon menaces not materializing in this alternate timeline, support from Stenbock and Krassow could, if not relieve, at least allow Riga to hold out until such time that Carl XII himself could arrive to take command of his armies; even in our timeline, Riga didn't surrender until July 1710. The presence of the King himself on the field would enable the Swedes to move their forces - which, by now, would include the remains of the main army, Krassow's troops, Ridderhielm's regiments from Wismar together with Swedish garrison troops from Elbing and Poznan, and possibly also Polish troops loyal to Stanislaw, a total of approx. 25'000-30'000 men - from Poland and counterattack in Kurland and Livonia, thus defeating the Russians once again in the Baltic provinces in the midwinter of 1709-1710. I know, the Swedes would be all the more exhausted, but with fresh reinforcements, they could still face Sheremetiev on numerically equal terms, and with Carl XII himself in command - well, the Swedes were able to win on far worse odds (for an example, witness Lewenhaupt against Sheremetiev in 1705). At the beginning of 1710, Sweden is once again the master of Livonia. Since the province and the port of Riga are not under Russian occupation in this timeline, there will be no Swedish ban on the Livonian trade and no Swedish privateer activity to block the British commerce on the Baltic; thus, most of the deterioration which took place in the Anglo-Swedish relations in our timeline will be avoided. With the important exception of the tar port of Narva - occupied by the Russians in 1704 and blockaded by the Swedes ever since - the naval stores will remain under Swedish control, and Britain will continue to have a relatively easy access to its vital strategic resources. Sweden will also be a good deal more receptive towards the British commercial interests in this timeline. The first, aggressive attempt to extort Britain by raising the prices of tar in 1703 had already proven counterproductive, and during the following years the Stockholm tar company was starting to back down, considering it more reasonable not to irritate Britain for the sake of short-term financial gains. Further in the north, the Russian success would be guaranteed. General Georg Henrik Lybecker's expedition against St. Petersburg in the summer of 1708 had been a total fiasco, and admiral Fedor Apraksin's galley fleet had operated undisturbed on the Gulf of Finland. Regardless of the events in the south, Apraksin can still lay siege with 13'000 men on Viborg (Viipuri) in March 1710, while the King is still reasserting Sweden's presence in Poland and Livonia. Even without the Tsar's presence on the field, the city will have to surrender to the Russians by June 1710, with Kexholm (Käkisalmi) falling shortly afterwards. The Russian takeover of Viipuri will, regretfully, also have a severe impact on the above-described Swedish commercial relations, given that the town traditionally covered approximately one-third of the Swedish-Finnish tar exports. As in our timeline, the capture of Viipuri would no doubt be followed with a quiet period on the Finnish borders, during which the Russians will concentrate on the threats in the south/southwest and continue their naval buildup on Ladoga and Onega. Given Sweden's inability to counter the Russian naval superiority, the Finnish - and ultimately, Swedish - coastline would be dangerously exposed to the raids of Apraksin's archipelago fleet. The question what course the war would take after the succesful Swedish operations in the Baltic provinces will be answered in the fourth part of the story. A quick summary of the events so far: the Russians have experienced a major defeat at Poltava and another one in the Baltic provinces, are dealing with an Ottoman threat from the south, and their allies aren't showing any sign of re-entering the war - but on the other hand, they can easily replace their losses, have conquered considerable territory in eastern Finland, their galley fleet operates freely in the Finnish archipelagoes and most importantly, the security of St. Petersburg is guaranteed. The Swedes are still unbeatable on the field, their armies have secured Kurland and Livonia, and the checks against their potential enemies are still holding - but on the other hand, they've had to forsake their invasion of central Russia, they've experienced severe losses, have little resources to replace them, and the King's determination to fight to the death is stronger than ever. So, what happens next? We'll close the loose ends in the south first. The Tsar's dealings with the Turks should be settled by the summer of 1710. Presumably, the war has been less dramatic in this alternate timeline. In our timeline, Peter's near-capture on Prut in 1711 resulted very much from his hasty and ill-prepared attack and equally hasty and unorganized retreat from the Danubian Principalities. The promises of support from the Princes of Moldavia and Valakia had made Peter to count on a general uprising of the Sultan's Christian subjects, which, however, did not materialize, and effectively destroyed whatever little chances of success the premature Russian attack may have had. This time the Ottomans have launched the offensive, and the Tsar is keeping in the defensive, so Peter has most likely kept a cooler head and managed to avoid getting caught. The initially favourable Turkish advance to the Ukraine will soon start to suffer from supply problems and organizational disintegration, with the Russians scorching everything to the ground and the Tatars pursuing their own goals. It won't take long until both sides will want to end the conflict as soon as possible, and the maritime powers, especially the Netherlands, will readily offer their mediation. Fearing that a potential Turkish victory over Russia might turn beneficial for France, The Hague dispatched Colyer to mediate the peace negotiations between Moscow and Constantinople in our timeline, and the same will no doubt happen also this time around. We can expect the treaty to be concluded sometime in April-May 1710, with terms broadly similar to our timeline; the Russians will have to give up their conquests on Azov, Taganrog and the Right-Bank Ukraine, and dismantle their fleet on the Don. Baltaci Mehmet can claim victory and concentrate on his secondmost important goal, the war against Venice, while the Tsar will once again be able to focus on Sweden. By the summer of 1710, everything will be ready for the big showdown in the north. The Swedes have the initiative, and Carl XII wants to finish the war and strike Russia down once and for all. The Russians have made advances in the north, so that's the direction where they'll also have to be defeated. And since the invasion of the Russian heartland has already failed, the solution now would be to destroy the very symbol of Tsar's power and ambitions; the new capital which Peter has dared to raise on Swedish territory, St. Petersburg itself. So, sometime in May-June 1710, a few months or so after the fall of Viipuri and a month after the Russo-Turkish peace treaty, the Swedish main army in Livonia will begin its advance towards the new Russian capital. How many men can Sweden scrape up at this point? Even with the previously-described losses from military campaigns, diseases and famine, we could still assume some 25'000-30'000 men under Carl XII in Kurland, most of them fresh reinforcements raised by Stenbock in Sweden. To these, we can add ca. 10'000 men or so under general Carl Gustaf Nieroth in Finland (Nieroth replaced Lybecker as the Commander-in-Chief in Finland after the fall of Viipuri in our timeline, and was a master in impossible; the man managed to muster an army of 9'000 men from the virtually exhausted country in the spring of 1711 - of these, 2'600 men had already been raised in Ostrobothnia during the spring of 1710). The obvious Grand Strategy would be to mount a two-pronged attack against St. Petersburg; Nieroth will do his best to harass the Russian lines in Viipuri and the Karelian Isthmus, while the King himself will arrive from the south, smash through the Russian forces at Ivangorod and Narva and burn St. Petersburg to the ground. After this disgrace of a city has been erased from the Swedish soil, His Majesty will be free to dictate his peace terms to the Tsar. I know, not terribly realistic, but as said, by now Carl XII would believe that he can walk on waters. What does the Tsar do? Most likely he has managed to find time to raise more troops during the autumn of 1709 and the spring of 1710; in our timeline, a total of 280'000 men were drafted to the Russian army during the war, and at the end of Peter's reign, its size had reached 350'000 men (130'000 regulars in the field army and 80'000 in the garrison troops, 110'000 cossacks and irregulars, and 30'000 in the navy). We can assume that even after Sheremetiev's defeat, Peter is ready to move additional 40'000 men to the northwest, so together with Apraksin's forces this would add up to an army of ca. 55'000-60'000 men. As the summer of 1710 arrives, the Tsar sees the Swedish Lion moving against his own city, his beloved Petersburg. He's definitely going to lead its defence personally - which means that we're looking at the final death-match somewhere near Narva in June-July 1710, with both sovereigns personally in command of their armies once again. In my judgement, there's no doubt of the result of the battle. Peter has learned from all his previous defeats, is defending a sacred ground he has claimed as his own, has once again absolute superiority in numbers and materiél, whereas Carl XII is attempting yet another bold gamble with massive self-confidence and meagre resources. It's a decisive defeat for the Swedes, in every sense. The whole Swedish army is decimated, and more. The King himself is killed. He got away from Poltava in our timeline, and made it to refuge in Turkey, and he succeeded in his ride to Stralsund - but where could he go from here? To Sweden? The Russian navy controls the waterways around the Neva estuary. To Finland? The Russian army is in front of him. To Poland? A long, long way to a potentially hostile country, and the Russians would be pursuing him. Will he surrender? No chance in hell. As the battle ends, Carl XII lies among the fallen. What consequences the Swedish defeat and the death of the King would have on Sweden's internal politics, the foreign relations and the overall course of the Greath Northern War, will be a subject to analysis in the fifth part. 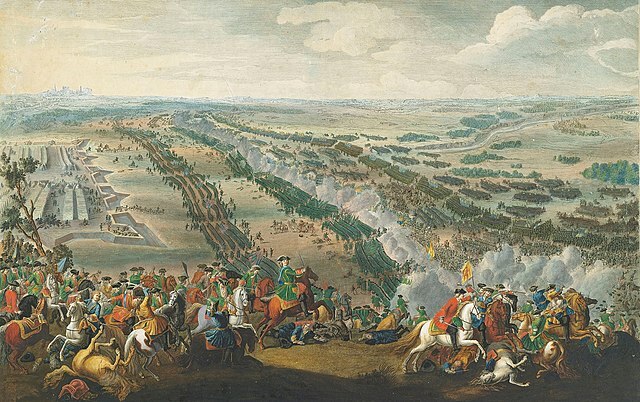 The decisive Swedish military defeat at the gates of St. Petersburg on July 1710, combined with the death of Carl XII himself, will undoubtedly unleash another round of hostilities, similar to those which followed the defeat at Poltava in our timeline; simultaneously, it'll also raise the question of succession and see the estates' attempt to strengthen their position, restore some degree of constitutional rule and negotiate a quick peace. We'll pay attention to the renewed conflicts first, and the Swedish domestic situation second. August the Strong will re-emerge to contest the Polish-Lithuanian crown. As soon as the dust has settled in the north, the Confederation of Sandomierz will commence its onslaught, which should be more than enough to force Stanislaw Leszczynski to finally abdicate and flee from the country. The Confederation of Warsaw will be dissolved, and the Saxon troops will march to Poland in late July 1710. August's position is still going to be far from secure, and he'll be desperate for Russian military assistance in the future. As in our timeline, the Saxon elector will most definitely be in no position to enforce his claims over Sweden's Baltic possessions - a matter which will be dealt with more closely later on. Denmark-Norway will rejoin the war and launch an assault against Holstein-Gottorp, which will be overrun in a week or two, given that there are no Swedish forces to speak of in Northern Gemany in this alternate timeline. As in our timeline, the Danes will also make a bid for their lost territories beyond Öresund and land at Helsingborg by November 1710, with the familiar slogan "aut nunc aut nuncquam" painted on their supply trains. Stenbock may be able to deal with the attack on Skåne, but since some of his original forces were dispatched to Riga back in 1709, he'll have to raise another army. On sea, the Swedes will have a run for their money. - The Danish naval threat shouldn't be exaggerated, though; at the time, the Danish-Norwegian battle fleet was numerically equal to Sweden's, with thirty-nine vessels and a total displacement of 61'000 tons. Furthermore, the Danes were surprisingly unwilling to risk a main battle in our timeline; both Køge Bugt and Rügen were very much draws and in the latter one, Danes had both the strategic advantage _and_ quantitative superiority, and still failed to convert it into victory. Likewise, Gyldenløve's success against the Swedish transports in 1712 was mostly a lucky strike. The undeniably major Swedish defeats in the hands of Tordenskjold at Dynekilen 1716 and elsewhere resulted probably just as much from Carl XII's strategically disastrous decisions as they did from the admitted brilliance of the Norwegian admiral - as a naval commander, the Swedish King was really below standards. Incidentally, I'm going with the scenario where Sweden's German possessions - Hither Pomerania, Wismar, Bremen, Verden - are neutralized and outside the war (see the second part for details). Two alternatives: either the Convention of the Hague did take place, but Carl XII chose to recognize it - as explained, he could have easily chosen to accept such a settlement this time around, since he wasn't locked in Bender with the Pomeranian bridgehead as his only chance of forcing the way out - or, a similar kind of declaration will be made by Sweden, Britain and the Netherlands after Carl XII's death. Thus, we can, at the very least, remove Brandenburg-Prussia and Hannover from the list of Sweden's enemies. Even in our timeline, Prussia was reluctant to join the coalition, mostly because of King Friedrich's resentment towards August the Strong's conversion to the Catholic faith, and the eventual decision of Friedrich Wilhelm I to join forces with Peter the Great in 1714-1715 was very much due to unique political circumstances which don't exist at this earlier date and most likely never will. Furthermore, Prussia's freedom of action is still constrained by the ongoing hostilities against Louis XIV. Of Hannover, more information will be given further below. As soon as the news of the King's death reach Stockholm, the Riksråd will summon the estates, and the Riksdag will convene in, say, the early August of 1710; the main initiative to end the war will be made by Arvid Horn, the Finnish Chancery President and Sven Lejonmarck, the Chief Justice of the Åbo Court of Appeals. All the four estates will unequivocally support peace and voice their opinions in the question of succession, which, for one, will be concluded with considerably less fuss than in our timeline. According to the resolution of Norrköping, unmarried princesses are the first in line for the throne in the case of no direct heirs, and since Carl XII's sister Ulrika Eleonora is still single, she's the undisputed legitimate candidate. I've decided to skip the idea of his marriage to the duke of Kurland, but the Hessian Landgrave will still commence his courtship on this year. So, as the story goes, Ulrika Eleonora is crowned as the Queen of Sweden in the autumn of 1710. With the King already dead and the estates pressing for her candidature, Horn cannot plausibly torpedo her ascendancy, and due to Ulrika Eleonora's solid right to the throne, the Holstein faction will have no arguments whatsoever to back their own claim. When it comes to peace negotiations, there's one factor working on Sweden's favour: the relations between Sweden and Britain are definitely better than in our timeline. As we've noted, there hasn't been any Swedish ban on Livonian trade, no Swedish privateer ordinances or attacks on British and Dutch merchantmen on the Baltic, and since Carl XII is out of the business and Görtz is butterflied out, there's no Swedish backing of the Jacobites. Supporting Sweden and maintaining the Balance of the North will still be in Britain's best interests, and the possible Russian dominion over the Baltic will still be regarded with apprehension in Britain. Also, the accession of King George I - who, as the Elector of Hannover, has his own designs for Sweden's North German possessions in Bremen and Verden - is still very much in the future, and even if the bishoprics should become an issue, it's not impossible that the Riksråd would be ready to bargain them away in exchange for diplomatic and military assistance in this alternate timeline. The new Tory government will no doubt offer to mediate with the same sincerity it did in our timeline, and whereas Carl XII refused the mediation, the Riksråd and Ulrika Eleonora will most certainly accept it. Whether the Tsar would be ready to agree to a British mediation for a negotiated peace at the time when he has won a decisive victory and could easily reach his claims without settlement is another matter. However, Britain can always use one option to press the issue, the same which was used a multitude of times during 1709-1721: a naval expedition to the Baltic. The War of Spanish Succession is already reaching its closing stage - from the contemporary perspective, of course, anything can still happen - and some of the distractions which hampered the British assistance for Sweden in 1719-1721, such as the South Sea Bubble Crisis, haven't materialized at this earlier date, so chances are that Britain will be able to throw a bit more concrete aid for Sweden this time around. The Swedish-British cooperation will be advocated by the Queen, Horn, and the British ambassadour in Stockholm, who, at this stage, is John Carteret, and the possible British intervention in the north will be one central aspect of the following, last parts. While the Queen and the Råd are making a scramble for peace, and the Swedish mainland is coping with a Danish-Norwegian incursion, the eastern parts of the realm will have to defend themselves alone, without any help from the mother country. After the destruction and rout of the main Swedish army on the gates of St. Petersburg, the Tsar will move to an immediate offensive against the Baltic provinces on August 1710. In a month or so, the Russians will have once again besieged Reval, Pernau and Riga, and the starved, half-dead shreds of Sweden's Baltic army - including the last Swedish troops from Poland, which have by now retreated in front of August II's Saxon forces - will be locked in the plague-infested Estonian and Livonian garrisons, liable to fall like skittles by the spring of 1711 at the latest. Despite of their upper hand, the invading Russians will also suffer from the winter, diseases and supply problems, which should prolong the sieges somewhat. Aside the Baltic provinces, Finland will also face another Russian attack. The repeated crop failures of 1704-1709 have left the country in a rather sorry state, and in addition, Carl XII has been drafting Finns like there's no tomorrow - the pre-war Finnish population was around 350'000, of whom 50'000 men were drafted during the war; a few thousand survived. However, as noted, the Finnish army still amounts to ca. 10'000 men at this point - 6'500 infantry, 3'500 cavalry - and is under the command of general Carl Gustaf Nieroth, who replaced Georg Henrik Lybecker after the fall of Viipuri. Nieroth kept the post until his death in 1712, after which Lybecker returned. Lybecker's incompetence quite simply cannot be exaggerated. For example, Apraksin's landing on Tervik in May 1713 owed its success almost entirely to Lybecker's passiveness; the arrival of the Russian reinforcements was delayed by a month, but the Swedish general made no attempt whatsoever to either attack the Russian bridgehead or to prevent the Russian reinforcements from linking with Apraksin's main army. After abandoning the Finnish coastline without any resistance, Lybecker withdrew to inland, effectively severing his own supply lines. The morale of the Finnish troops was totally wrecked, and in August 1713, Stockholm finally had the good sense to remove Lybecker, but by then, it was already too late and the damage had been done. - However, in this alternate timeline, Nieroth is still in command, and he's highly competent, one of the best Swedish generals of the day, comparable to Stenbock himself. We've already established that Nieroth's army participated in the offensive against St. Petersburg by attempting to divert the Russian forces to the Karelian Isthmus and harassing their communication and supply lines; even in our timeline, the Finnish detachments under colonels Johan Stiernschantz and Carl Gustaf Armfelt were able to control the Viipuri-St. Petersburg highway for most of the summer. The Russians can, however, maintain their garrison in Viipuri by sea, and come August 1710, Apraksin will concentrate an army of ca. 15'000 men, of whom 5'000 cavalry, in the northwest. The Russian infantry will man their galleys and mount an amphibious landing on the west bank of the Kymi river, whereas the cavalry will advance overland, destroying everything as it moves on. Nieroth will be sharp enough to anticipate the landing and prepare accordingly. As in our timeline, the Russians will most likely choose to disembark their forces at Helsingfors (Helsinki), which will be defended by Armfelt's detachment. The first landing attempts can be repulsed, but eventually Armfelt will have to withdraw and torch the town to the ground; not a great loss, the place was already ridden by the plague, which killed 30% of the inhabitants during the autumn of 1710. Although the sight of Helsinki in flames is beautiful, Apraksin won't spend too much time admiring it, but instead head his fleet towards Borgå (Porvoo). Meanwhile, Nieroth will seize the opportunity to take action against the Russian cavalry (commanded by either Robert Bruce or Mikhail Golitsyn... I'll choose the first candidate). The initial Russian advance will be harassed by guerillas - again, something that Nieroth had realized but Lybecker hadn't - until the Finnish main army will engage the enemy at Abborfors (Ahvenkoski) and defeat it on the riverbanks; with 8'000 men against 5'000, it shouldn't be much of a problem. The victory will be a welcome boost for the overall morale, and show to the Finnish troops that despite the grievous losses of the past ten years, the country can still be defended. By the time when Apraksin's army disembarks at Borgå or Pernå (Pernaja), Nieroth can attack it from all sides. Apraksin will no doubt be quick to realize that his reinforcements won't be arriving and be smart enough to not risk a battle, but instead re-embark his troops and withdraw the fleet back to the archipelago. Vice-admiral Nils Ehrenskjöld's small Swedish-Finnish galley flotilla has presumably also made its entrance by this point, but will hardly dare to pursue Apraksin's superior fleet. Nevertheless, the end result is that the Russian invasion has been fought back... for the time being. As September arrives, Nieroth's forces have ground the Russian offensive against Finland to a halt, the morale and discipline of the Finnish troops will be high, and the desertions and resentment which plagued the army under Lybecker won't be an issue. The financial support of the army will still be hung by a thread, but the harvest of 1710 will provide adequate rations for the soldiers, the arms shipments from Sweden will reach Finland, the levée-en-masse will add 2'500-3'000 men to the ranks later on the same year, and the diseases will ease off as the winter finally arrives. The deteriorated condition of the roads after the autumn rains, together with an organized guerilla action, will pose an obstacle to a renewed Russian overland advance, which can still be met with one-on-one odds on the battlefield. In the west, Nieroth will keep a watchful eye for another landing attempt, especially since Apraksin definitely won't discontinue ravaging the coast whenever he gets the chance. The Swedish archipelago flotilla and admiral Gustaf Wattrang's battle fleet squadron should still be able to block the Gulf at least up to Helsinki, denying the Russian access to Åbo and Åland archipelago, and as the Gulf of Finland eventually freezes, the naval operations will effectively end for the year. The Russians can raid the territory all the way to the Kymi river, but otherwise they'll have to postpone the invasion of Finland either to the late winter or the spring 1711. By then, the Tsar himself will arrive to take command of his armies. The Russo-Swedish negotiations will begin in January 1711, with count Andrei Ostermann as the Russian representative, Arvid Horn as the Swedish representative, and the British ambassadour John Carteret as the mediator; all three will have clear instructions and opening positions. The Tsar will demand Ingria, Karelia, Viipuri included, Estonia and Livonia - the latter one in direct violation of his treaty with August II, but as told, at this point, Peter won't much care of the feelings of his Saxon ally anymore. Sweden will be ready to cede St. Petersburg, Ingria, Kexholm and perhaps compromise the territories ceded already once in the Treaty of Vallisaari (signed 1657, the settlement granted Kokenhausen, Marienburg, Neuhausen, Dorpat and Vasknarva to Tsar Aleksei for three years). However, Ulrika Eleonora won't be ready to swallow the loss of the western half of the Karelian Isthmus and the Baltic provinces quite yet; the Baltic garrisons are still holding out, the military success in Finland has strengthened the Crown's determination to press for more honourable terms, and there's a fair chance that Britain will assist Sweden in retaining Estonia and Livonia. The Russians will take note of the last factor, and aside of enforcing his terms by military means, the Tsar will also begin a diplomatic offensive; Boris Kurakin, the Russian ambassadour in London, will be given the task of persuading Britain to accept Peter's conquest of the Eastern Baltic littoral. Threatening to cut off the Archangelsk trade is always one option to pursue - at the time, Britain imported ca. 75% of its hemp from Archangelsk, and the remaining 25% from Riga; one of the reasons why Britain objected to the Russian supremacy on the Baltic was precisely because it would have given the Tsar a total control over the British naval stores. The events in the west will no doubt facilitate the Russian decision to resume the advance against Finland as fast as possible. By March 1711, Stenbock will have defeated the Danes in Skåne, forcing the blistered remains of King Frederik's army to withdraw back to Sjælland. At best, Reventlow may have been able to hold on to Malmö and perhaps Landskrona, but otherwise the Danish offensive to reconquer the lost territories, conducted under the slogan "now or never", has ended with a definite "never". At the same time, Louis XIV will inform Harley and the Tory government of his preliminary peace terms, negotiations between Britain and France will begin, the death of Emperor Josef will bring the War of Spanish Succession to its final closing stage, and the maritime powers will once again have the freedom of action to concentrate on terminating the bothersome northern conflict. On May 1711, a fleet of sixteen British warships, commanded by admiral Sir John Norris, will sail to the Baltic. Stanhope's orders to Norris and Carteret will be unambiguos; preserve the Northern Balance, defend Sweden's interests in the peace negotiations... and if necessary, destroy the Tsar's Baltic Fleet while at it. The sudden appearance of sixteen British ships-of-the-line in Öresund on May 1711 has a sobering effect on King Frederik IV. Although Norris makes it clear to Stenbock that the Royal Navy won't assist the Swedes in a landing on Sjælland, the mere presence of the fleet is enough to raise the bad memories of the lightning strike Denmark suffered eleven years ago. Despite a sense of betrayal - Danish soldiers have fought in Marlborough's forces, after all - the sovereign of Denmark-Norway reluctantly decides that the most sensible course of action would be to meet the British demands and sign a peace with Sweden. A six-months' armistice is declared in June, and the negotiations begin. The Danish-Norwegian territorial demands in Skåne and Bohus are bluntly brushed aside by Carteret, and the one and the only gain that Løvenørne manages to secure for the conglomerate kingdom is the ducal part of Slesvig; neither the Queen nor Horn have any interest in the vexing alliance with Holstein-Gottorp, and are quite ready to sacrifice the Duke's possessions. The Danish acquisition is officially recognized by Sweden and guaranteed by Britain. Pressured by the British demands for an equal competition in the Baltic trade, Sweden also has to renounce her exemption from Öresund dues. The final peace treaty is signed in Fredriksborg in the first week of December, by which time the situation in the north will have been long resolved. Regardless of the brief break after Apraksin's raid against Helsinki, Finland's condition will continue to deteriorate as the winter of 1710-1711 passes. Generalkrigskommissariat will turn down Nieroth's requests for reinforcements and statskontoret will refuse to give him any money; all remaining men and cash in the mother country are earmarked for the defence against Denmark and the planned expedition to recover the Baltic provinces. The sad truth is that the dirt-poor eastern borderland has to base its defence on its own, exhausted human and economic resources. Except for a few thousand militiamen, the army has virtually no reserves and has to rely its financial maintenance on a variety of forced contributions, auxiliary taxes and a few Dutch credits delivered by merchant Johan Henrik Frisius. The situation is untenable; past the spring of 1711, Finland will be unable to maintain its army, and the defences will collapse even without a Russian attack. The only real hope is a quick peace - but the twisted irony of the history is that the succesful resistance of the Finnish army on the autumn of 1710 has backfired on the country, encouraging the Swedish Crown to turn down the Tsar's terms and reconsider continuing the war against Russia. Thus, Finland is blessed with the final blaze of glory and Nieroth is given the chance to go down as a true warrior, as the new Russian offensive comes in the late winter of 1711, immediately after the five-months long siege of Reval has ended with governor Hans Henrik von Liewen's surrender - and this time the attack against Finland will be far, far harder than the previous one. Stenbock's victory in Skåne, the temporary deadlock in the Russo-Swedish peace negotiations and rumours of British naval intervention have convinced Peter that the war has to be taken on the Swedish mainland as soon as possible, which means that Finland has to be conquered before the sea opens in the spring. On March, the Tsar leads an army of 18'000 men from Reval to Helsinki, over the frozen Gulf of Finland, and begins to construct a military base in the town. Simultaneously, Apraksin moves once again out from Viipuri with an equal force; the winter will make the supplying of both armies a difficult task, but it can be done. As usual, the Russians will make a good use of their ski troops; they had lots of those, recruited from the Fenno-Ugrian and other indigenous peoples of the Empire. In a sudden, Nieroth is faced with an enemy almost four times of his size, threatening him from two directions, and Stockholm still won't send any help, but nonetheless orders him to stand his ground. Withdrawing inland is out of the question, the past experience under Lybecker has shown that retreat has a devastating effect on the morale of the Finnish troops, and the store-houses which the army has in the south can't be abandoned, either. Nieroth has to fight, so win or lose, he leads his men against the Tsar. The fate of Finland is decided in the ensuing battle of Mäntsälä, fought amid the snow-drifts in the bitter cold of the Northern winter. Nieroth's forces put up a fierce struggle, several Russian guns are captured in near-suicidal charges, but in the end, the outcome is what it is; the battle turns to a massacre as the Finnish infantry steadfastly refuses to surrender and fights to the death. By the end of the day, 5'000 Finns and Nieroth himself lie dead on the battlefield. Kaleva's son is struck down, permanently. In the frenzy of the victory, the Tsar orders Golitsyn to loot and raid the nearby parishes. Before the Easter, the Russians march to Åbo (Turku) and secure their control over southern Finland. Inter arma silent leges; as the Finnish army collapses, so does the social order. Provincial governors, judges, priests and other crown officials cross the Gulf of Bothnia to Sweden as fast as they can, the farmers living in the battle zones scramble for their hideouts in the forests, and the surviving soldiers begin a bitter guerilla campaign against the invaders; the "Great Wrath" begins. As the sea opens in May, the Russian galley fleet ships more and more men and material over the Gulf of Finland, building the Finnish southern coastline into a springboard for the planned invasion of the Swedish mainland. However, the preparations become a subject to reconsideration, as Wattrang's Swedish battle fleet squadron returns to patrol the Gulf on the early June. The deep waters off Helsinki and Porkkala favour the large Swedish vessels, and despite his numerical superiority, Apraksin dares not to take his gunboats within the firing zone of the Swedish battleships. The fate deals its final, cruel card on early July, as Norris' British fleet finally arrives to the Åbo archipelago. Facing the threat of a combined Anglo-Swedish fleet, Peter decides to abandon his plans of naval action against Stockholm, and instead, gives an order to raze the conquered Finnish territories, aiming to deprive Sweden of a base for a possible future offensive against Viipuri or St. Petersburg. Starting from the late summer of 1711, the eastern half of the Swedish realm shares the fate of the other trans-Baltic lands, and experiences a total, systematic destruction. Turku is burned to the ground, half of the farmsteads in the region between Aura and Kymi scorched, fields destroyed, cattle killed, tens of thousands men, women and children taken to slavery in Russia, and thousands of people murdered by the Tsar's soldiers. As the autumn of 1711 passes by, peace with Russia begins to seem like a good idea once again. Finland is bleeding to death, the number of refugees in Stockholm has hit 10'000, the Bank of the Estates has suspended all loans, the final loss of the Baltic provinces and Finland has deprived the Crown of nearly a half of the next year's revenues, and the upcoming winter will raise the threat of the Russian attack against the Swedish mainland over the frozen Sea of Åland. Continuing the war with British support doesn't appear a viable option; despite the naval assistance, Sweden would have to organize the reconquest of the Eastern Baltic with her own land army, and indelningsverket is already creaking under the strain - Görtz is out of the picture, and I doubt that the Råd would risk issuing a forced draft. The British promise of an annual subsidy of 300'000 riksdalers is a cold comfort when the Swedish wartime budget is beginning to swallow thirty millions from a state revenue barely over three and a half millions. Furthermore, the British determination to preserve the Balance of the North has its limits; after ending one costly war against France, the Townshend-Stanhope ministry is reluctant to start another one against the Russian Empire, especially since the Tsar is quick to find out the right strings from which to pull in order to persuade Britain to agree to the new status quo. The cold truth is that Sweden is in no position to recover her losses, which the Queen and the Råd will finally begin to realize. Thus, the negotiations restart in earnest in November 1711, with all sides united in their desire for peace this time around. The final peace treaty between the Kingdom of Sweden and the Russian Empire is signed in a conference held on Åland islands in January 1712. The Tsar gets all his demands; Narva, Ingria and Kexholm as "ancient Russian land", Viipuri and the western half of the Karelian Isthmus as a buffer zone for the conquests, and the two Baltic provinces of Estonia and Livonia in exchange for a compensation of two million riksdalers paid by Russia to Sweden. The rest of Finland is returned to Sweden. After twelve years of continuous fighting, the Great Northern War is finally over, and Sweden has lost its great power status. The eventual peace settlement between Sweden and Russia was essentially similar to the one signed in our timeline; some people may find this resolution boring and blame me for a lack of imagination. Maybe there's no need for me to make any justifications, but it's perhaps still best to mention that I was never aiming for any particular outcome, and if the end was close to the history we remember, well, the more the things change, the more they stay the same. I started to proceed from the presumed Swedish victory in the battle of Poltava, and at every possible turning-point in the subsequent course of events I chose the alternative which seemed the most probable option. Thus, the Russo-Turkish War of 1709-1710, the Swedish reconquest of the Baltic provinces in 1710, Carl XII's offensive against St. Petersburg and his death on the same year, the neutralization of Sweden's German territories, Ulrika Eleonora's coronation, the Danish failure to reconquer Skåne, the anticlimactic British intervention and the year's deadlock in the Russo-Swedish peace negotiations with its tragic consequences. The death of Carl XII on the battlefield is probably the one element which could be questioned the most, even though I explained why I thought it'd be the most likely outcome in the script. However, "What If Carl XII had survived the battle of St. Petersburg in 1710?" is certainly also a perfectly acceptable scenario. So, what's different in this alternate timeline? First and foremost, Sweden is still, at least nominally, an absolute monarchy. Since Ulrika Eleonora's claim as an unmarried princess was solid, the estates were in no position to extract concessions from her by threatening to approve the Holstein succession. The death of the King had also made his sister's coronation rather urgent, and the rivalries between the Råd and the estates still persisted. There is no Holstein faction, and the peace treaty has granted the Russian Empire no excuse to meddle in Sweden's internal affairs as a guarantor of the constitutional order. Nonetheless, the defeat has still discredited the absolutist rule and both the Råd and the estates have re-emerged as competing centres of power, with the will and the intention to exercise their authority in the future. The new Queen doesn't have the same talent in playing her opponents against each others as her brother and father had, although she could solve this by delegating most of the power in Horn's hands. As the next monarch rises on the throne, however, the estates will definitely insist on including the ratification of a new Constitution in the Royal Oath. Whether this happens after Ulrika Eleonora's marriage in 1720 or after her death in 1741, is open for questions; as a nominally absolute monarch, she might decide not to concede the crown to Fredrik this time around. In both cases, the transitional "monarchia mixta"-period marking the gradual demise of the absolute rule might cause the following "Age of Liberty" to be somewhat less plagued by party strife than in our timeline, even though the question of Ulrika Eleonora's succession will still constitute a potential stumbling-block. It's speculating, but if these dangers can be avoided and the constitutional ideas will be allowed more time to grow ripe, Sweden might be able to produce a parliamentary form of government which could survive unchanged from the 18th century up to the present day. In some ways, Finland has suffered more than in our timeline, and in some ways, less. The events in the last months of the war made the Russians resort to mass destruction in a far larger scale than in our history, but on the other hand, the total occupation period has been considerably shorter in this alternate timeline (1711-1712 instead of 1713-1721), so the country will be able to recover from the disasters of the invasion fairly quickly. Even still, the wartime experiences have undermined the Finnish confidence in the mother country, marking the first step in the road towards the separation of the two parts of the realm. However, this doesn't need to happen; if the Crown manages to avoid engaging in revanchist wars against Russia during the 18th century, it can also regain and even strengthen the trust of its Finnish subjects. The unitary state will last as long as the governments are responsible and the international situation is favourable. Strangely enough, Sweden has retained exactly one piece of territory which was lost in the peace settlement of the Great Northern War in our timeline; the city of Stettin, thanks to the decision to agree to the neutralization of the North German possessions and the Prussian non-involvement in the war. Regretfully, this will only serve to increase the Prussian ambitions towards the port and the Pomeranian coastline later on, bind Sweden closer to the Continental politics and increase the Swedish dependence on France as the century passes. Remaining outside any Central European War is going to be difficult, and ending up entangled in at least one of them will be inevitable. As in our timeline, Denmark has failed to gain her lost territories, and will have to settle for the status of a neutral, minor power as the 18th century passes. Just as the Swedes and the Finns, the Danes will also have to learn how to deal with the Russian menace; the imminent connection between Romanovs and the house of Holstein-Gottorp, manifested in the marriage of Grand-Duchess Anna Petrovna, the daughter of the Tsar, with Duke Karl Friedrich, will certainly materialize also in this alternate timeline. The dynastic alliance between the Russian Empire and the arch-enemy of the Danish Royal House may yet threaten the very existence of the Danish-Norwegian conglomerate kingdom; even in our history, the eventual Danish salvation in 1762 depended almost entirely on chance. As for Norwegians, well, needless to say, this alternate timeline has left them without one important part of their national history; Carl XII's legendary siege of Frederiksten and his mythical death on the walls of the fortress did not take place in this version of the Great Northern War. Whereas Sweden and Denmark may yet be able to survive the subsequent turbulence in the 18th century, the fate of the Polish-Lithuanian Commonwealth has definitely been sealed by the Great Northern War. The restoration of August II and his Saxon Guard at the volition of the Confederates of Sandomierz will continue to divide the Rzeczpospolita against itself, and the traditional Polish animosity against the German King will resurface fairly quickly. The resistance of the Szlachta will be reorganized in the Confederation of Tarnogród in 1715-1717, and the King-Elector will require Russian assistance in suppressing the rokosz. The subsequent events will materialize largely in accordance to the history we remember; the Silent Sejm will assemble under the watchful eye of Menshikov's soldiers, and effectively transform Poland-Lithuania into a Russian protectorate. Stanislaw Leszczynski's return will be thwarted by the future partitioning powers; most likely Sweden will manage to avoid involvement in the War of Polish Succession also in this alternate timeline, especially if Horn is in charge of the foreign policy. Curiously, although the victory at Poltava hasn't prevented the imminent downfall of Sweden's great power status, it has produced a positive outcome for the Danubian principalities. As told, in our timeline, Peter the Great's triumph over Carl XII in Ukraine motivated the princes to seek Russian help in overthrowing the Ottoman suzerainty, and this cooperation with the enemy led to the later removal of the native leadership by the Porte and the beginning of the so-called Fanariot régime in the principalities. In this alternate timeline, the Russian defeat at Poltava, followed by the short, victorious Turkish campaign against Azov, caused the hospodars to abandon all hopes of Russian rescue, and thus, both Dimitriu Cantemir in Moldavia and Constantin Brîncoveanu in Valakia will hold on to their posts somewhat longer - the latter may yet end up decapitated, Brîncoveanu had already earned a reputation as an unreliable double-dealer well before 1709, and the Sultan had made provisions for his elimination in favour of Cantemir. But, for the time being, at least, the Romanian principalities will still maintain their political, economic and cultural ties with Central Europe, continue the positive developments begun in the 17th century and avoid the corruption, excessive taxation, degradation of the peasantry and overall anarchy which burdened them under the Fanariot rule. The events in the southwestern Europe and elsewhere will follow their due course, with the potential for variation increasing every year. As we've seen, the Swedish agitation for a renewed Turkish attack against Russia discontinued in 1710, leaving the victor of Azov, Grand Vizier Baltaci Mehmet, and his Fanariot supporters free to pursue their another favourite goal, which is to regain the losses of Karlowitz. Thus, on November 1711, the Ottoman Empire commences hostilities against Venice, and recaptures Morea with a quick land-sea expedition in the summer of 1712. The Spanish interests will dictate a continued Habsburg noninterference against the Porte until the final conclusion of peace between Vienna and Paris, but chances are that the settlement would be accelerated this time around, especially since the Ottoman action in the southeast would coincide with Villars' success over Prinz Eugen at Denain. The peace between Louis XIV and the Emperor might be signed already in Utrecht, after which Austria would turn to deal with the Turks. In this situation, the Romanian princes might opt for Austrian support, which would, in many respects, be a more viable alternative than the Russian assistance. I wouldn't entirely rule out the possibility of the principalities falling within the Austrian sphere of influence in this timeline's equivalent of Passarowitz, particularly since the above-described Polish situation could distract the Tsar from intervening in the Balkans at the moment. However, Peter still has many good years left, so he might still be able to exploit the situation and eventually restore the Russian access also to the Black Sea already in his lifetime. One of the little-known curiosities of the historic Battle of Poltava was the fate of one Swedish officer, Johan Gustaf Renat, who was among the soldiers captured by the victorious Russians and whose endeavours turned out to have an unexpected impact on the history of the 18th century Central Asia. After his capture, Renat was transported beyond the Urals with several other Swedish prisoners of war as part of colonel Buchholz's expedition in 1716. During the expedition, Renat was captured for a second time near the fortress of Iamyshevsk south of Omsk, this time by an Oirat Mongol raiding party. Renat's capture by the Mongols proved to be a fortunate incident for him, and in a very short time, the Swedish veteran had become the confident of Tsewang Araptan (1643-1727), the Khan of Dzungaria himself. Renat was also accompanied by a Swedish woman, Brigitta Christina Scherzenfeldt, who, after losing her husband in Poltava, had married captain Michael Ziems, a Mecklenburger officer in Russian service, and followed him to the east; while Renat became the Khan's personal advisor, Brigitta became the tutor of the Khan's favourite daughter. During his seventeen-years' custody, Renat followed the Mongols on their campaigns as a military advisor and taught them to use and manufacture black-powder weapons - at first, muskets, and after a couple of succesful raids against local Russian metalworks, even artillery pieces, fourty-six of which the Mongols constructed themselves. Renat also founded some indigenous metalworks, a textile manufactury and a printing press, which all made Dzungaria exceptional among the other steppe empires. Renat's assistance was invaluable to his master and allowed Tsewang Araptan to build a steppe empire of immense size, a power which was able to challenge even the Qing China. Renat and Brigitta were both very richly rewarded and eventually freed in 1733; they managed to return back to Sweden with another Russian mission, and upon his return, Renat presented the University of Uppsala with two detailed maps of Dzungaria, which were very unique in Europe back then. The artillery corps which he had established for his Dzungar hosts played a decisive role in obliterating the Kazakhs in the wars of the 1740s and paved the way for the Oirat conquest of Transoxanian lands during the same decade. Renat's personal importance cannot be doubted. It's noteworthy that in our timeline, no one of the several Russian captives which the Dzungarian Mongols had taken over the years ever managed to rise to a similar position as Renat, or show a comparable expertise in military matters; the capturing of a Swedish officer who also happened to have a background in engineering was a stroke of incredible luck for Tsewang Araptan. In a situation where Renat would not be captured in 1716 - which, needless to say, is one likely consequence of a timeline which has witnessed the victory of Carl XII at Poltava - it seems rather unlikely that anyone else could play the same role as he did. Thus, in this alternate timeline, the Dzungars would inevitably lose one important asset which allowed them to carve out a large dominion in Central Asia in the history we remember. However, it also has to be noted that even in our timeline, the Dzungarian empire didn't last long enough to decisively influence the history of Central Asia. After a violent succession crisis and a civil strife after the death of Khan Galdan Tsereng in 1750, the realm had to accept the intervention and the hegemony of the Qing China. The subsequent attempt by Khan Amursama to start an uprising against the foreign rule led to the final destruction of the kingdom by a Qing invasion, and approximately two-thirds of its one-million population were wiped out in a historic genocide ordered by Emperor Qianlong in 1756-1759. The conquered Dzungar territories were attached to the Qing Empire as a part of the newly-established westernmost province, Xinjiang, and remain as a part of China still today. Whether Tsewang Araptan would still go ahead with his invasion of Tibet in 1717, how the Qing China might react to it, and what would be the long-term effects on the Central Asian history is still open for questions. It doesn't seem unlikely that the absence of Renat's endeavours which triggered the rise of Dzungaria to a regional power might actually result in a better outcome for the local population. In a situation where Dzungaria does not appear as a large, threatening steppe empire which it was in our timeline, it's possible that the Qing China would not deal with it in quite as drastic fashion as was the case in the history we remember; thus, instead of becoming a Central Asian powerhouse and going out in a blaze of glory, Dzungaria might continue its existence as a simple, ordinary steppe kingdom engaging in occasional raids against its neighbours but otherwise provoking no substantial aggression from the surrounding great powers. One knock-on effect might also be that Dzungaria ends up within the Russian sphere of influence instead of becoming part of the Chinese domain. However, a further study must still be done in order to clear up all the consequences which the alternate Poltava and the different fate of J. G. Renat might have on the history of Central Asia in general and Dzungaria in particular.